B.J. PATGIRI, DHIRAJSINGH SUMERSINGH RAJPUT. chemical nature and safety profile. Key words: Naga, Bhasma, Lead, Safety, Toxicity. B.J. PATGIRI, DHIRAJSINGH SUMERSINGH RAJPUT. A BRIEF REVIEW OF NAGA (LEAD) THROUGH AYURVEDIC LITERATURE. J Res Educ Indian Med . 2013; 19(1-2): 49-59. B.J. PATGIRI, DHIRAJSINGH SUMERSINGH RAJPUT. A BRIEF REVIEW OF NAGA (LEAD) THROUGH AYURVEDIC LITERATURE. http://www.jreim-ayushjournal.com/?mno=191931 [Access: April 25, 2019]. B.J. PATGIRI, DHIRAJSINGH SUMERSINGH RAJPUT. A BRIEF REVIEW OF NAGA (LEAD) THROUGH AYURVEDIC LITERATURE. J Res Educ Indian Med . (2013), [cited April 25, 2019]; 19(1-2): 49-59. B.J. PATGIRI, DHIRAJSINGH SUMERSINGH RAJPUT (2013) A BRIEF REVIEW OF NAGA (LEAD) THROUGH AYURVEDIC LITERATURE. J Res Educ Indian Med , 19 (1-2), 49-59. B.J. PATGIRI, DHIRAJSINGH SUMERSINGH RAJPUT. 2013. A BRIEF REVIEW OF NAGA (LEAD) THROUGH AYURVEDIC LITERATURE. Journal of Research and Education in Indian Medicine (Est.1982), 19 (1-2), 49-59. B.J. PATGIRI, DHIRAJSINGH SUMERSINGH RAJPUT. "A BRIEF REVIEW OF NAGA (LEAD) THROUGH AYURVEDIC LITERATURE." Journal of Research and Education in Indian Medicine (Est.1982) 19 (2013), 49-59. B.J. PATGIRI, DHIRAJSINGH SUMERSINGH RAJPUT. "A BRIEF REVIEW OF NAGA (LEAD) THROUGH AYURVEDIC LITERATURE." 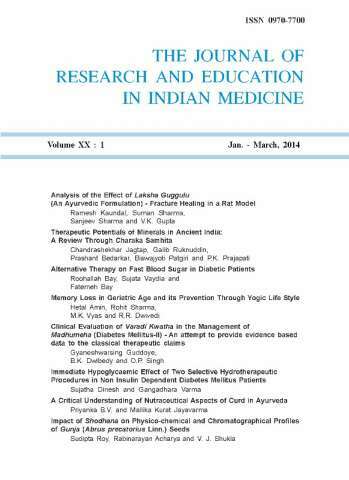 Journal of Research and Education in Indian Medicine (Est.1982) 19.1-2 (2013), 49-59. Print. B.J. PATGIRI, DHIRAJSINGH SUMERSINGH RAJPUT (2013) A BRIEF REVIEW OF NAGA (LEAD) THROUGH AYURVEDIC LITERATURE. Journal of Research and Education in Indian Medicine (Est.1982), 19 (1-2), 49-59.